Free download Google Android Device Manager app for android mobile with APK file. It is one of the most useful apps developed for android operating systems. The main purpose of Device Manager is to find out and locate the smart phone using android operating system that was lost or stolen. 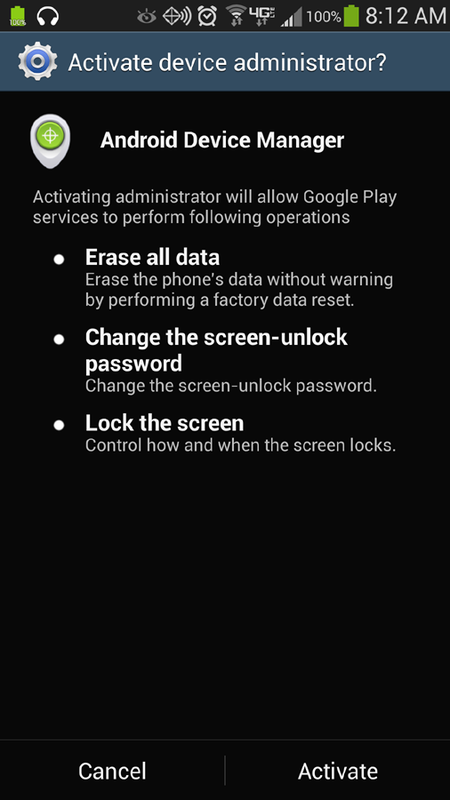 Android Device Manager requires a gmail ID to work and proceed so you must have an internet connection on your smart phone to make it secured by Device Manager. Android Device Manager works on simple methods. After the installation, when the application is run by the user and login process is completed, Device Manager detects the model of your smart phone and also saves IMEI number in its database. The application also shows the model name of your smart phone and then it detects the location using internet connection and GPS satellite. To properly secure your mobile phone, you need to go to the settings and check the options of “Remotely locate this device” and “Allow remote factory reset”. After selecting the 2nd option another screen will be popped out to confirm the activation of Android Device Manager. Tape on the Activate button and you’re done.